Sometimes nature provides the most delicious flavors. All you have to do is cook it right. To me, the greatest sauce on a burger is an egg yolk. There is nothing more delicious than biting into a perfectly cooked burger and piercing the yolk of a fried egg that adorns the sandwich. The natural flavor and richness of the beef and yolk together just can't be beat. Another gift from mother nature: Sweet Corn! Pick it from the garden, buy it from the store or just steal it from the neighbors. All you have to do is place it on a hot grill, husks and all, for half an hour and you have a festival of pleasure ready for your taste buds. 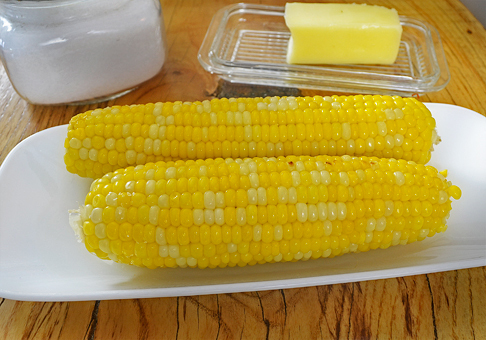 Add a little salt and butter - It might convince you that grilled corn on the cob could be considered an option for your final meal if given the choice. 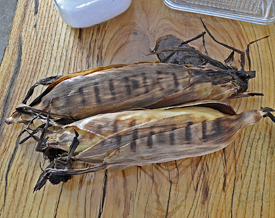 The natural casing of the husks provide the perfect steaming packet to cook the corn in. All you have to do is peel it back and clean off the silk and its ready to go. In the last two weeks I have made grilled corn on the cob at least 5 times. Last weekend, I was out at the family campground and I made it on two different nights. My niece and nephews would grab a cob and walk around with it to snack on just as they would an ice cream cone. They would even come back for seconds with corn covering their faces and lodged in their teeth, but they didnt care, they just couldn't get enough. Same goes for myself. It's that time of year in the Midwest when sweet corn is plentiful - get some! Sweet corn hot off the grill! On a hot grill pre-heated to medium high place corn, and cook 30 minutes, turning once half way through cooking. Remove from grill and let rest 5 to 10 minutes. Peel off husks and wipe away any silk. Coat with butter and sprinkle with salt. Eat off the cob.